Some say that there are only two kinds of houses in Az., those that have termite problems and those that will. But is it inevitable that your property will be damaged by termites or that you’ll need to call for termite control in Paradise Valley? It’s Not If You’ll Need Paradise Valley Termite Control, It’s When! Every single day homes in Paradise Valley are being silently attacked by insidious little wood eating creatures called termites. Before human settlements arrived in the Phoenix valley and Paradise Valley, there were 1000’s of colonies of termites living on the Sonoran Desert floor. Termites thrive when provided with a source of moisture, shelter from the hot desert sun and an endless supply of fresh food … your home! With the influx of the human population, termite infestations in Paradise Valley are commonplace. With over 5,000 households in Paradise Valley alone, termites have a limitless supply of fresh food for years to come. A Paradise Valley pest and termite exterminator can help you to avoid a calamity: the catastrophic loss of your home to termites. Don’t be lulled into a false sense of security, Even though, they’re minute in size, termites can cause don’t let their size fool you; termites cause major property damage every year. The reason for the threat that termites pose is because of both their diets and their sheer numbers. Google Map pinpointing the location of Varisty Termite and Pest Control in Gledale, Arizona. To begin, even though they are part of the cockroach family (order Blattodea), it is only about 10% of the 4,000 different species of termites that can be classified as pests and are the ones you want to call a Paradise Valley termitecontrol company about . In fact, in tropical areas some termites actually serve a vital ecological purpose. Termites are detrivores, meaning that they eat debris and recycle decomposing materials as nutrients that enrich the soil. In addition as they consume plant detritus and feed on decaying vegetation, they help clear the way for new growth. So, a few termites don’t cause us any problems, and are obviously not anything to be concerned about. Termites that take up residence near human inhabited areas, however, are a source of major concern. 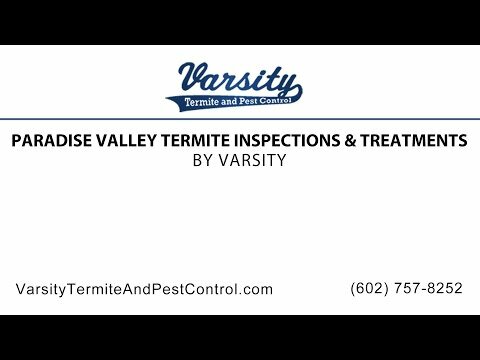 At Varsity Termite and Pest Control we are proud to be serving the Paradise Valley area and helping our customers in the region to get rid of termites invading their property. If termites are gathering on YOUR property you can count on our Paradise Valley termite inspections and treatments to find the problem and eradicate the infestation. We are a family owned and operated company whose highly trained technicians are up to date on the very latest and best termite treatment methods. Our customers are our first priority and we strive daily to go the extra mile for our customers needs. SO if you have a termite problem, let Varsity be the solution. Call us at 602-757-8252 or visit us online at varsitytermiteandpestcontrol.com, today. Let’s say your house has no wood or wood products., so why should you worry about termites?} It’s not that simple, unfortunately. In an ideal world, termites would only eat one variety of wood, and we could build our buildings appropriately. It would merely be a matter of reducing wood in building construction. However, termites also eat several other substances including: plastics, paint, silicone adhesives, paper, cloth, and carpets. Sometimes, termites might not eat non-wood materials such as these, but they will also sometimes use them to build nests. The result of termite infestation is ultimately property damage in varying degrees of severity. Termites can cause entire structures to collapse. In addition, as they can also often remain concealed and eat wood from the inside, their presence is often not detected until its too late. It is a far better idea to get on the phone to a termite and pest control service in Paradise Valley and have a termite inspection done to stop the problem before it gets worse. Because of how much damage they can cause, termites can be extremely destructive. They have even eaten money that was thought to be safe in a vault in India. Termites generally don’t infest the Arctic, they prefer the same temperate latitudes that people favor. Termites damage approximately half a million homes in the U.S. each year, and cost anywhere from two to five billion dollars each year in either repair costs for the damage that they’ve caused or in costs to control them. Termites also produce large amounts of greenhouse gases. With all that in mind, you can see why exterminators that provide termite and pest control services in Paradise Valley are often so busy. Termites can be combated effectively by setting up barriers that are poison, traps, or a combination thereof. There are a lot of termite control products out there, but they are of dubious effectiveness. Though, there are plenty of products out there that are incredibly effective, such as the Sentricon Termite Colony Elimination System. A termite inspection is your only way short of having a wood structure collapse. So ask yourself when you’d rather know? Before your home has been damaged is probably your best choice. So call Varsity Termite & Pest Control, your local Paradise Valley termite exterminators and protect both yourself and your property from becoming a statistic.